Why didn't I go sooner? As much as I try not to, I often take things for granted. When I moved to Huntsville, I took many things for granted: that I would have a successful move, that I would enjoy my job, that I would find things to do, that I would make friends, and maybe in the back...ok, the very back of my mind, I took for granted that I would slide right into my new endocrinologist's office with ease, and he would pick right back up where my pediatric endo left off. I had no doubt it would be hunky-dory-smooth-sailin [saline? no...sailin']. It only took me one appointment to realize that I had made a terrible mistake. I had moved 1600 miles away from the only people I ever entrusted my diabetes care to, and now Dr. Horrible was making me feel guilty for my test strip prescriptions, chastising me for gaining weight (with no game-plan help), changing my basal rates to a flat number all-day, putting me on life-time cholesterol medication and being a general pain to get any paperwork from (i.e. one letter for the FAA that took a month for him to pump out, WTF?!). I was leaving every appointment in tears, and instead of being encouraged to wrangle my Diabetes monster, by the end I felt too beaten down to even try. Dr. Horrible was not only killing me, he was killing my will to keep my diabetes under control. It started taking a toll on the people around me: on mom, dad, and the BF. Mom was about to slap on a fake mustache and pretend she was my lawyer, dad had enough cuss-words to make your head spin, and the BF was tired of dealing with my post-Dr.-Horrible cry fests. So, I finally listened to them. Today was my first appointment at the Vanderbilt Eskind Diabetes Clinic in Nashville. I was nervous, tired, and a little blood-sugar high, but the visit met and completely exceeded my expectations. After all the general info was taken (blood pressure, A1c, pump download, etc. ), we met with Dr. P, a Type 1 specialist. I can not tell you how much her bubbly face and excited personality meant to me. Finally, someone actually cared about me, about my disease, about my needs and my future. She answered most of my questions before I asked them, took copious notes, and explained everything she was thinking. 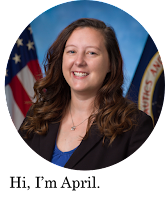 She explained why it is relatively easy to go from an A1c of 9.0 to 8.0 but much more difficult to go from 7.6 (my A1c today, don't judge) to 6.5. We talked about fine tuning and she told me I was doing a good job of it on my own, which is necessary to get an A1c in the sixes. She said my blood work was awesome and we have a plan for tackling my cholesterol without medication. She made me feel comfortable with my prescriptions and told me to call at any time if I want them changed. We planned my next two appointments with long term goals, and next time I will meet with a nurse practitioner and a dietitian to fine tune my pump, talk about CGM, and create a weight loss plan. [Side note: after I explained my job to her and why it would be beneficial to have a CGM, she made a note for the nurse practitioner to call my insurance before my next appointment to get things started with that...this is miles above Dr. Horrible]. The dietitians, NPs, blood work, everything basically is right there in the clinic, and it is beautiful. Since the BF came along, she asked if we were thinking about a family. We were both like, "Hello!!! We're not married yet!!!!" hahaha. But we said eventually yes, and she told us all about the robust OB practice there that specializes in High Risk Type 1 Diabetes pregnancies. Woot. I like that. Generally, I like everything about Vanderbilt. It was amazing, I feel refreshed and excited to go back. I feel much less anxiety knowing I have a place that I can trust, that I can lean on, that I can call anytime and they will be more than happy to help me. I'm happy to have someone trust that I can take care of myself, and yet realizes it does get overwhelming and frustrating. They want to give me all the tools possible to improve my Diabetes management without me begging, like any endocrinologist should. 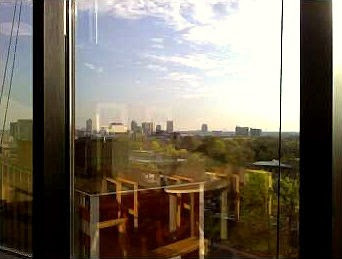 It's hard to tell from my crappy cell-phone pic, but that is the Nashville skyline...it was gorgeous! Thank you to everyone who pushed me to try it out. It's definitely not fun or easy switching doctors, especially an endo who is supposed to be significantly involved in your care. I feel that I have finally found "the" endo clinic for me. 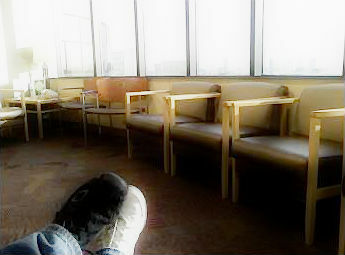 And here is the cliche waiting room pic, complete with non-old-people shoes and windows! I love hearing when PWD find the right clinic! Awesome. That's great! It sounds like she's very proactive, which is something I think my endo is lacking...even though she is supposed to be "very good." Good for you--I know it can be hard to branch out and find the right doctor. Fantastic! I really believe that the team you work with can make all the difference. Glad you found a good doctor and team to support you!! April, that sounds so great. I am glad the BF went along also. YAY for productive visits with good doctors! It's a great feeling to have someone in your corner. I went through something similar with I was first diagnosed and my PCP wanted to use outdated treatment methods and refused to let me carb count because "sliding scale gives better control." Uh-huh. Sure. :) So happy you found a good one!! !